I had the pleasure of previewing the holiday/resort collection from Lulu Guinness today. Those familiar with the designer, know that she's very whimsical. Her pieces are bold and not for the faint at heart. For holiday, the inspiration was astronomy, fortune and tarot cards. A snakeskin star shaped clutch caught my eye. It comes in pewter and gold, which will be quite popular shades for the holiday season. 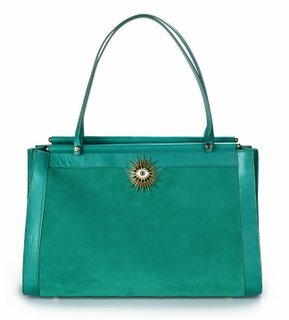 Various purses and totes had a silver-star closure, rather than the usual square or button shape. If you love your shoes, as much as your bags Lulu has a whole line a suede, structured bags with enamel or embroidered shoe prints. The above styles will be available around November. I will try to secure images of the bags so you bagistas can be the first customers to see them! For more immediate shopping, check out the fall Lulu Guinness Couture collection. It's the glamorous 1950's style that Lulu always embodies in her personal style and the direction of her brand. But, this line really takes the glam factor to a new level. Rich in emerald, plum, red and black the handbags are reminiscent of a chicer era when jeans were uncommon and pantyhose were a must. Today's woman can pair the suede purses or shoulder bags with jeans or a pencil skirt, and look equally breathtaking. 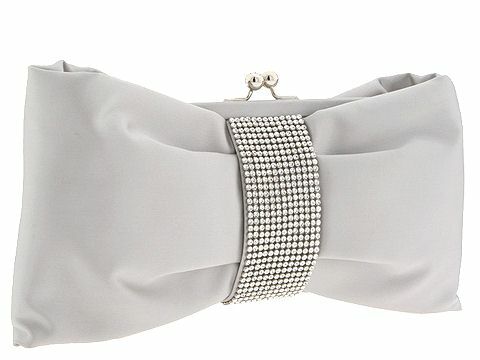 I do warn you that actually holding one of these bags makes you want to embrace the fabulously glamorous fashion season we are about to have - dust off your brocade coat, slip on your silk gloves and don't forget your Lulu Guinness bag. Skip the generic pink and blue diaper bag. You’re a gal with panache and a unique sense-of-style. These baby bags have flair and personality. 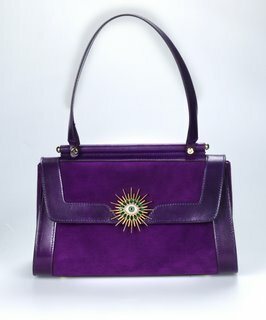 Jackie Cawthra, the stylish mind behing Belen Echandia hanbags, is cronically her search for good craftsman. Check out her blog at http://www.blog.belenechandia.com/. Between sipping coffee in Ecuador and learning about Panama hat weaving, Jackie shared her story of lawyer turned handbag designer. Don't forget to check out www.BelenEchandia.com - you can also borrow many of the styles by logging onto www.BagBorrowOrSteal.com. I found these playful clutches by a UK brand called Susse Collection. OK, so they're actually makeup bags, but they can do double duty. My favorite the white makeup bag with the smiley sunshine - it adds bit of whimsy to your outfit. I'm thinking about picking up the brand for our BagTrends.com SHOP. So, you may be able to pick up these cute creations state side soon. You might be melting in the heat, but retailers are desperate to unload their summer inventory. Now is the best time to shop for clothing and accessories. I did a little online hunting. Here are some great deals I found. I'm a glamour gal. I rarely wear jeans. The one pair of sneakers I own are hardly used. In fact, if I could, I would wake up in stilettos. So, it's no surprise that I gravitate towards anything that screams Old Hollywood glamour. Case-in-point, my new obsession with kiss-lock frame handbags. They have a wonderful vintage feel that transport my mind into an F Scott Fitzgerald book. For one brief moment I am Daisy, Gatsy's object of affection. Judith Leiber Slim Octagon clutch in black Austrian crystals is never going to go out of style. The price tag is high, but the longevity is worth it. If you’re looking for the real deal, check out your local vintage shop or www.vintagebag.com. Not only will the selection impress you, but the founder Cara Chell is quite knowledgeable in the field of vintage bags. You just might learn a something while you shop! Thursday was an exciting day for fashion and lifestyle bloggers. 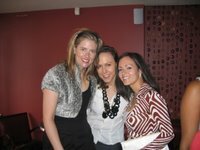 I am proud to say that the launch of Bloggers Who Brunch was a hit. Our guest speakers were phenomenal. 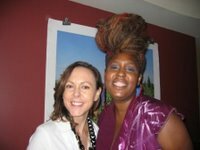 Thank you to: Samir Arora of http://www.glam.com/, Constance White of http://www.ebay.com/ Meghan Cleary of http://www.messmeghan.com/, Najwa Moses of http://www.stylaholics.com/; Kathryn Finney of www.BudgetFashionista.com. A special "heart" to my partner-in-crime Lesley of www.FashionTribes.com. As we mentioned at the event, the purpose of Bloggers Who Brunch is to learn from one another and establish our credibility as fashion/lifestyle experts. Lauren Dimet of http://www.secondcitystyle/ paired her Hayden Harnet bag with a flowy blouse and divine jewelry. My mom with her tan David and Scotti bag looked perfect! As for me, I was rocking my Ted Rossi pearlized white python clutch. It paired nicely with white pants and a brown/white zebra print wrap shirt from Diane von Furstenberg. 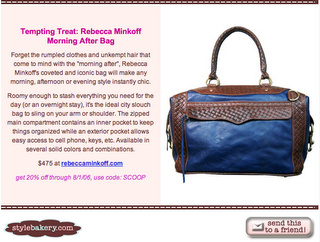 A quick note: our gal Rebecca Minkoff is having a delightful sale on her handbag line. Visit www.rebeccaminkoff.com and type in SCOOP at checkout. You will receive 20% off now through 8/1/06. My humble apologies for being MIA for nearly 3 weeks. I had a delightful vacation in Eastern Europe (pictures to come) and I've been planning an event that is being held today in NYC. Bloggers Who Brunch, a new organization created to celebrate and elevate the best female lifestyle and fashion bloggers. We are unifying and putting a face on this valuable voice. We believe that readers enjoy our content because it's fast, fresh and unpretentious. Sponsored by GLAM Media, Bacardi and Bust Magazine. I will be sharing pictures tonight and more information.